Andhra Pradesh Foods, a state government enterprise, is ramping up its fortified food production capacity. It provides ready-to-eat and ready-to-cook foods like upma mix, sweet porridge and khichdi mix, fortified with iron, zinc and other vitamins, to infants and pregnant and lactating women under the Centre’s Integrated Child Development Scheme (ICDS). The effort to double its production and increase the number of beneficiaries from three million to five million has come following its partnership with the Global Alliance for Improved Nutrition (GAIN). The Swiss NGO has offered it a grant of US $1.8 million. “It is also providing us technical support, for instance, to increase the shelf-life of fortified food products,” says P Satyanarayan Reddy, managing director of AP Foods. Andhra Pradesh is not the only state where fortified food is the flavour of the times. Global NGOs, pharma companies and international donor agencies are all scrambling to provide aid, technology and partnerships to fight malnutrition, or hidden hunger, in India. 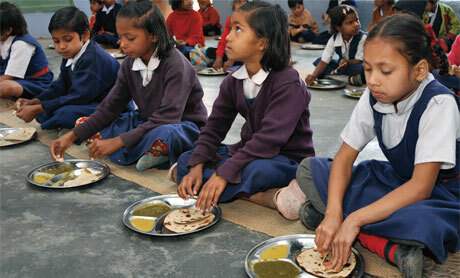 According to UNICEF, one in every three children in the country is malnourished. For instance, PATH, an international NGO, along with US pharma giant ABOTT, is pumping $1.5 million to introduce iron-fortified rice in the Indian market under brand name Ultra Rice. In 2009-10, PATH launched pilot projects in Rajasthan and Andhra Pradesh where it fed Ultra Rice to around 245,000 schoolchildren under the mid-day meal (MDM) scheme. When asked if the NGO studied the impact of the fortified rice on the children, Dipika Matthias, director of PATH’s Ultra Rice project, said, “As the introduction scheme was not a clinical trial, no biological data was collected from the children.” The project, also funded by the US Department of Agriculture, Bill & Melinda Gates Foundation and GAIN, plans to reach out to five million people over the next three years through government food distribution schemes like the Public Distribution System (PDS), MDM scheme and ICDS. Fortification: It is a process in which external nutrients (vitamins and minerals) are usually added in chemical forms to commonly consumed foods to increase the nutrition level. Biofortification: It is a technology where a nutrient is either increased or added to a crop through conventional plant breeding or by tweaking the genes through GM technology. If you think eating fortified or bio-fortified food is enough to meet your micronutrient deficiencies, think again. Micronutrient availability to human body depends on three factors: quality and quantity of micronutrients and ability of the body to absorb a particular nutrient. B S Ramakrishna, professor of gastroenterology, CMC Vellore, says micronutrients have a longer shelf-life in drugs than in fortified food. Minerals like iron and zinc do not get completely absorbed by the body. In a healthy person, 10 per cent of iron ingested gets absorbed. He cautions against excessive intake of vitamins. Fat soluble vitamins like A, D and E should be taken under guidance as body has no mechanism to get rid of the excess. They can get deposited in liver and lead to complications. Even biofortified crops have limitations. “The nutrient content of added beta-carotene decreases with time in bio-fortified crops,” says K N Rai of ICRISAT. NIN experts say light sensitive and labile nutrients like Vitamin A, B-complex and iodine also degrade over time. Although intentions behind fortification of food could be genuine, nobody knows what is going on. There is no monitoring on the safety issues associated with fortified food products. In several states pilot projects are going on through government schemes without any knowledge of the government. In October 2011, while reviewing the implementation of MDM scheme, the world’s largest school feeding programme, a mission to Madhya Pradesh found that NGO Naandi Foundation was supplying fortified meal under MDM scheme but government officials remained oblivious of it. The mission received information that the Foundation was fortifying wheat flour with iron, folic acid and zinc on alternate days. “During our visit, we found there was no permanent nutrition expert posted in the centralised kitchen. We were told that the nutrition expert visits when required from the Foundation’s Hyderabad headquarters,” says Sachin Jain, a mission member and advisor to Supreme Court Commissioners for Madhya Pradesh. His team noticed several other irregularities, such as there was no transparency in purchase and procurement; machine-made chapattis would became so hard that children find them difficult to eat. The situation is likely to prevail in other states too, Jain adds. Naandi Foundation, which has been providing mid-day meal to over a million children in five states since 2003, says it supplies fortified wheat and lentils. “We had experimented with fortified rice using PATH’s Ultra Rice. But we suspended it as it formed lumps on cooking. Children did not find it palatable,” says Leena Joseph of the Foundation. The non-profit claims a study by the All India Institute of Medical Sciences in 2010 showed haemoglobin levels in children rose by 10 per cent after consuming its fortified food for three months. Studies by the National Institute of Nutrition (NIN), a body of the Indian Council of Medical Research (ICMR), however, showed an otherwise result. “Consumption of iron-fortified rice through MDM for eight months significantly raised the level of stored iron in body. But it has not made any significant additional impact on haemoglobin status, says K Madhavan Nair, micronutrient research scientist with NIN. It takes at least four to five years to observe the actual impact, he adds. Researchers with the institute say fortification should be done through evidence-based strategies. ICMR has set guidelines in this regard. For example, a kg of wheat flour should be fortified with 60 mg of iron and 1,500 microgram of Vitamin A. But whether NGOs conform to the guidelines can only be monitored by the Food Safety and Standards Authority of India. FSSAI did not respond despite repeated communications asking whether it has rules and regulations in place for fortifying foods supplied under government schemes and whether it monitors the products. The next big revolution is biofortification. Unlike fortification, biofortification is a process where nutrients are increased in a food by tweaking the crop. ICMR has already formed an Interagency Group on micronutrients to look into techniques to improve nutrition of food through biofortification. K N Rai, principal scientist with the Internation Crops Research Institute for the Semi-Arid Tropics (ICRISAT), says biofortification is a better way than fortification. “This is a more natural way to improve nutrition. It solves the problem in a better way through the grains that people are already eating.” He added that at present ICRISAT is working on increasing iron and zinc in sorghum and pearl millet and beta-carotene in pigeonpea and groundnut in India (see ‘India set to grow biofortified crop’, Down To Earth, March 1-15, 2011). Nigeria, Mozambique and Zambia are already growing biofortified cassava, sweet potato and maize, he adds. B Sesikeran, director of NIN, says biofortification is still in the initial stage of scientific development. With time, it may become an ideal technology. But unlike fortication, it would not be suited for fortifying a food grain with multiple micronutrients, he adds. Loveleen Kaur Khera, a dietician in Chhattisgarh, says before deciding what is better, we must understand the Indian psychology. Vitamin pills are a good source of nutrients, but they are counted as medicine. Similarly, fortified food are not considered natural. Besides, stability of micronutrients in fortified food is a concern. Biofortified food faces a bigger challenge. The commonly used technique to grow such crops is genetic engineering, which is under cloud on safety issues. Since colour and taste are important aspects of the Indian food, people would not accept any new product unless it is palatable, she adds. For instance, people in West Bengal are complaining against the fortified wheat flour provided under PDS. It is red in colour and does not taste good. Its shelf-life is short. Khera says natural food is the best source of nutrition. Fortifed food implemention should be there in other states like Bihar,Orissa,Jharkhand etc.Common people should be made aware of such facilities which is possible with the help of Govt. organisation and NGO's. Some thing good is happening, it should continue with some precaution.